Outline of IPA | Industrial Power Alliance, LTD. It takes about 40 minutes from Tokyo station to Oyama station by Tohoku Shinkansen Line. Note that Tohoku Shinkansen "Yamabiko" doesn't stop at Oyama station. 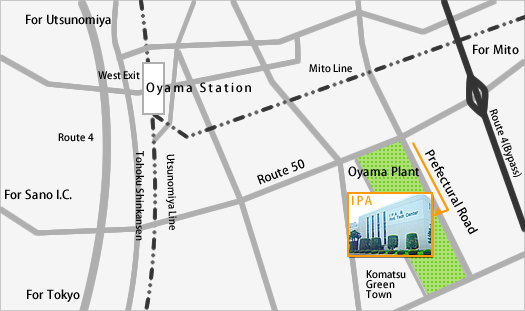 It takes about 10 minutes from the East Exit of Oyama station to IPA ( Komatsu Oyama Plant) by taxi.